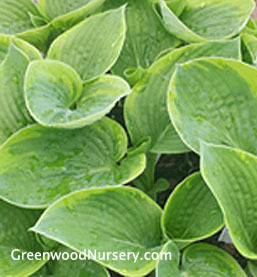 Place Hosta Francis Williams plants along a brick path or right under a pergola and is often called the classic Hosta. A favorite of shade loving plants, the Francis Williams displays wide blue green leaves with heavy gold margins. The Francis Williams hosta has beautiful summer white blossoms on 36 inches stems that flower in June.